Fight enemies around the Castle of Midenhall to raise your level a little. Go northwest to find the town of Leftwyne. Good weapons and armor can be purchased here. North of Leftwyne is the Castle of Cannock. You will discover that the Prince has left for the Spring of Bravery in the east. Enter the cave far to the east of Cannock. Ask the old man by the spring in the northwest corner of the cave where the Prince of Cannock is and he will tell you that he left for Midenhall Castle. Go to Midenhall Castle and speak with the king. He will tell you the prince has left the castle. Go northwest of the town of Leftwyne. Speak to the Prince of Cannock in the inn there and he will join you. Travel a ways west of Cannock to find the Lake Cave. You will find the Silver Key in a chest on the second level. The Silver Key will allow you to open all the silver-colored doors. Open the door in Leftwyne to find a lottery where you can use Lottery Tickets for a chance to win a prize. Enter the monolith southwest of Cannock and pass through the cave below to reach the next continent. Keep going south to reach the town of Hamlin. Cross the river to the south and go west to find the ruins of the Castle of Moonbrooke. The spirit of the King of Moonbrooke will tell you that the princess was turned into a dog. Leave the castle through a hole in the wall in the top left corner of the castle and walk along the western wall. Enter again at the south end and descend to the basement to find the sole survivor. He will tell you that you need the Mirror of Ra to restore the Princess of Moonbrooke to her original form. Continue east from Moonbrooke until you can see four bridges on the screen at the same time. Search the swamp to find the Mirror of Ra. Return to Hamlin and use the Mirror of Ra while facing the dog there. The Princess of Moonbrooke will revert to her true form and will join your party. Go northeast from Hamlin and then follow the east coast south for a long time until you find the Tower of the Wind. On the first floor of the tower, climb the stairs in the far top-right corner. Keep climbing up the side of the tower. Eventually you will climb back down on the inside and you will find the Cloak of Wind in a chest. When equipped, the cloak will allow you to float down when you jump off a tower and end up several squares away. Leave the tower and return to Hamlin. Keep going west from town until you reach a monolith. Enter it and climb back out on the other side of the river. Travel northwest for a long time and you will eventually come across two towers on either side of a river called the Dragon's Horn. Climb the southern tower and jump off the top facing north with someone equipped with the Cloak of Wind and you will land on the other side of the river. Continue northeast and you will find the port town of Lianport. Defeat the two Gremlins in the northwest part of the town do save the young lady. Follow her to her grandfather who will give you his ship. Sail the ship due north of Lianport until you find a shallow square in the middle of the ocean. Search the square below it to find the Treasures. Return to Lianport and use the Silver Key to reach the man on the east side of town. He will give you the Echoing Flute in return for the Treasures. When you blow the flute in an area, an echo indicates that a crest is nearby. Sail east to Alefgard. It is a lot smaller than in the original Dragon Warrior. You will notice that the king of Tantegel has gone into hiding. Enter Charlock Castle across the straight from Tantegel Castle. Inside you will find the Sword of Erdrick and the Dragonlord's grandson. He will give you some advise for defeating Hargon. Sail to the town of Zahan in the southeast corner of the world. You can get there if you sail north from the string of islands just east of the Spring of Bravery near Cannock. When you approach the dog it will run toward a tree. Search the tree to find the Golden Key. This key will open all red doors. Sail west and a little north to the southeastern tip of the main continent. Just a little further west you will find the town of Wellgarth. Use the Golden Key to enter the town. Speak to the tool shop owner on the west side of the city and select the blank item. He will sell you the Jailor's Key for 2000 gold. The guard in the prison on the east side of town will tell you that Roge Fastfinger escaped from his jail cell. Enter his cell (the empty one) and walk into the wall on the right side to find Roge Fastfinger. Speak to him and he will give you the Watergate Key. Go to Cannock Castle and open the chest behind the red door to find the Shield of Erdrick. Use the Silver and Golden keys to enter the treasure room of Midenhall Castle where you will find the Token of Erdrick in one of the chests. Use the Golden and Jailor's keys in the basement to reach the Evil Clown. Defeat him to get the Staff of Thunder. Enter the monolith southeast of Tantegel and west from Hamlin to exchange the Token of Erdrick for the Helmet of Erdrick. Return to Hamlin by Moonbrooke and use the Golden Key to open the red door. Descend the stairs and use the Jailor's Key and attack the Ozwargs. Search the top-right square where one of the Ozwargs was standing to find the Water Crest. Go to the fire monolith off the southeastern tip of the main continent either by sailing to it or by warping in from some other monolith. The fire monolith has three travel doors and a flame in the middle of it. Search the ground just behind the wall in northeast corner to find the Sun Crest. Either sail south from Midenhall or enter the warp gate in the monolith southwest of Midenhall to get to the Castle of Osterfair. Entertain the king by fighting the Saber Lion and he will give you the Moon Crest. Enter the tower on an island southwest of Hamlin and west of Moonbrooke. Walk around the outside of the first floor before going into the center and then climb the bottom-left of the four stairs. Near the top of the tower you will meet an old man who will tell you to follow him. He will lead you into a trap and you will be attacked by four Gremlins. Defeat them to get the Stars Crest. Speak to the woman in the house locked by a red door in Tantegel to learn where to find the Dew's Yarn. Enter the north tower of the Dragon's Horn southwest of Lianport. Climb to the third floor and keep searching the ground randomly until you find the Dew's Yarn. Sail to Zahan in the southeast corner of the world once the Prince of Cannock has attained level 17. Cast Stepguard to walk across the barrier and find the Magic Loom in a chest in the room to the left. Sail up the river east of the monolith north of the town of Beran in the southwest part of the world. When the river ends, get out to the west and keep walking north and then east. Eventually you will reach the town of Tuhn. Give the Dew's Yarn and the Magic Loom to Don Mahone and return after saving and resetting the game to receive the Water Flying Cloth. Note: after giving Don Mahone the Dew's Yarn and the Magic Loom, you can collect these items again from their original locations. After picking up the Water Flying Cloth from him, you can give him these items again and he'll make a second Water Flying Cloth for you. Use the Watergate Key you got from Roge Fastfinger in Wellgarth to open the water gate at the far north end of the town of Tuhn in the forest behind the inn. The river next to the town will fill up. Hike back to your ship and leave the river. Follow the coast southeast and enter the next river. You will sail through the new part of the river and be able to get back to Tuhn. Use your ship to cross the river south of Tuhn and enter the Tower of the Moon. Climb up until you are near the top, use the Golden Key to open a red door, and then descend back down to the bottom level. You will find the Moon Fragment in a chest. From Osterfair, sail southwest to find a cave surrounded by shallow water. Use the Moon Fragment to raise the water level and remove the shallows so that you can enter the cave. On the second level, you need to go through a small band of lava to a stairs beyond it to reach the third level. In the big lava room, take the stairs on the left side to get to the wizards' lair. Defeat the two Evil Clowns and take the Eye of Malroth from the chest in the room behind them. Sail to the town of Beran on the large island in the southwest part of the world. Step on the travel gate in the middle of town to warp to a monolith near Rhone. Go to the swamp west of the monolith and use the Eye of Malroth. The entrance to a cave will appear. In the bottom right corner of the basement filled with Horks you will find the Life Crest. You should have all five crests now. Leave the cave and sail to the tiny monolith island northwest of Osterfair and south of Midenhall. Step on the white square at the lowest level and Rubiss the Enchanter will give you the Charm of Rubiss. Return to the cave to Rhone. You need to be careful where you walk because there are many pits you can fall into. Consult my map to find a safe way through. Be sure to find the Armor of Erdrick and the Thunder Sword about halfway through the cave. To find the Thunder Sword you will have to fall into the pit near the bottom-left corner of the huge square room. Continue up until you reach the other side of the cave. You will now be in Rhone. From the cave exit, travel northeast and eventually you will find a monolith. The old man will restore your HP and MP and will save your game. There is also a warp gate back to Beran. Follow the northern edge of the valley all the way to the west and then travel south to find Hargon's Castle. Use the Charm of Rubiss when you enter the castle to dispel Hargon's illusion. Use the Jailor's Key to open a hidden door behind the throne on the left side. Use the Golden Key to open the next door. Stand in the tile in the middle of the barriers and use the Eye of Malroth to ascend to the next floor. Before the end of the fourth, fifth, and sixth floors you will have to fight Atlas, Bazuzu, and Zarlox. 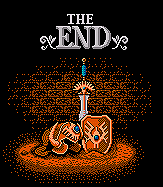 These enemies will remain defeated until you turn off the game, so you can exit Hargon's Castle, return to the monolith to get your HP and MP back, and then return to Hargon's Castle without having to fight them again. On the top floor you will fight Hargon. Once you have defeated Hargon and are about to leave, Malroth, the final enemy, will attack you. After you have defeated Malroth, leave Rhone and sail to Midenhall Castle. Your father will make you king and the game will end.